Colchicum speciosum have large striking flower heads, white at the base leading to pale pink at the apex. What appears to be a stem is in fact a long tubular flower, with the ovary being retained beneath the soil! The seed head becomes visible when the pedicel elongates in spring along with the leaves. It is an ideal bulb for planting in turf or with deciduous shrubs, providing a varied interest. Do not remove the dying leaves until they have dried out completely in summer. 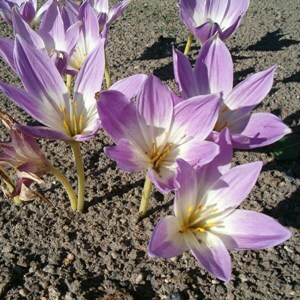 Colchicums prefer a fertile moderately well drained soil. Colchicums first common name was naked boys. In the Victorian era this was changed to naked ladies as the Victorians deemed the new name more decorous with less embarrassing connotations. Colchicum, although related to the genus Crocus should not to be confused with it as all parts on the Colchicum plant are toxic if ingested and if in contact with the skin may cause an irritation.